The killing of 16 civilians by a US soldier increases tensions in the country. Anti-Western feelings are running high. US Defence Secretary Leon Panetta visits Afghanistan to mend ties with the Karzai government. Kabul (AsiaNews) - For some of Afghanistan's Christians, tensions are running high in the country after a US solider killed 16 civilians in Kandahar. Coming just a few weeks after copies of the Qur'an were burnt on 20 February at the Bagram military, the killing provoked violent protests across the country that left 40 more people dead. Sources tell AsiaNews, that Afghans are exasperated by events like the one in Kandahar, this after 10 years of war pitting international military forces against the Taliban. "Resentment against the West and Christians is growing stronger, even though no direct threats have been made against individuals," sources say. "In the capital and provincial cities, foreigners leave their embassies or diplomatic compounds less and less." 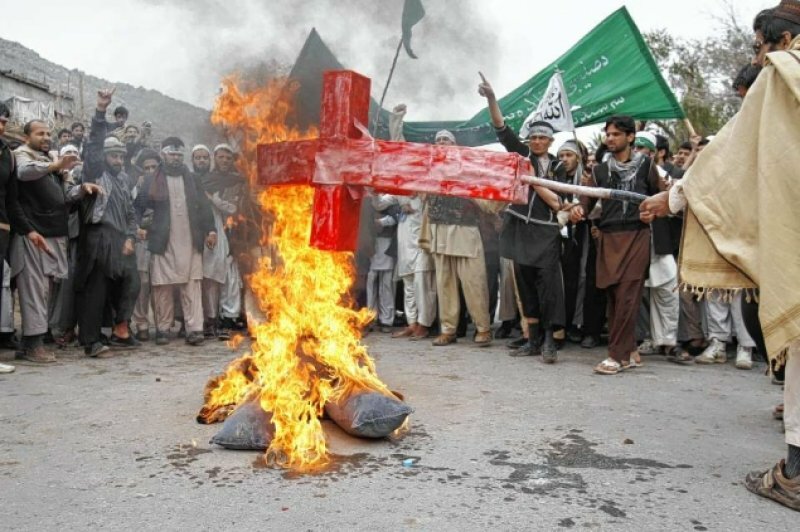 International media have shown afghans protesting by burning crosses and Christian symbols. For most Afghans, the West and Christianity are the same, the sources note. "Sadly, the crazy act of a madman will be paid by Christians." Still, "ordinary Afghans still respect foreigners and are grateful for the work of thousands of volunteers, including Catholics, in the fields of education, health care and business in the past ten years." "Muslim extremists are behind the current climate of hatred," sources explain. "They have been successful in shaping public opinion in a society where illiteracy and ignorance are widespread." Blunders by US troops in the past few months have been a boon for the Taliban, who can exploit popular resentment against the occupation to boost their power over the country. For months now, foreign intelligence groups have been following Taliban moves and are now worried about their calls for revenge against the occupying forces. The next few months will probably see more attacks against foreign troops in the capital and other Afghan cities, further weakening the foreign military mission in the country. In a surprise move, US Defence Secretary Leon Panetta arrived today on two-day visit to Afghanistan in an attempt to contain the fallout from the killing of 16 civilians and the burning of the Qur'an.